Did you know that there are more Indian restaurants than any others in Abu Dhabi? That is quite a statistic according to zomato.com. The choice is unbelievable, from restaurants that are easy to miss like your chaat shops where you can have a quick bite for 5 AED to your marginally larger little restaurant where you can have a meal for 10 AED; from your Indian restaurant in shopping malls to the high-end restaurants in 5* hotels. But those are not all. 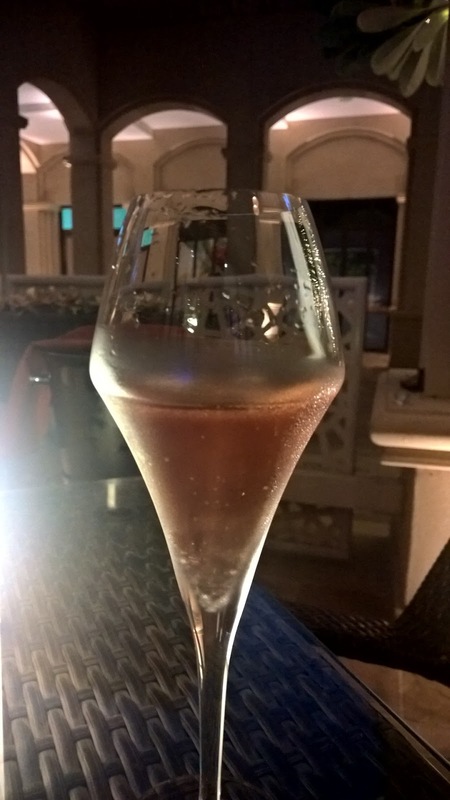 There is a smaller group of independent restaurants where you are able to get the level of service at high-end hotels but without having to go to a hotel. 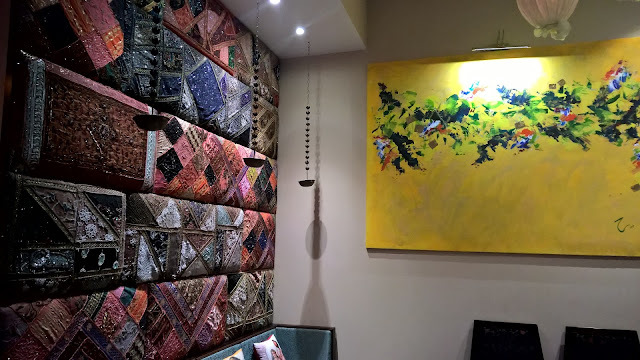 That is where Avasa Indian Kitchen fits in. The evening is hot, but thanks to a very effective outside a/c unit, it is very pleasant. Terrace seating is obviously a must, but I notice the charm of a smaller space inside the restaurant - next time, I muse to myself. 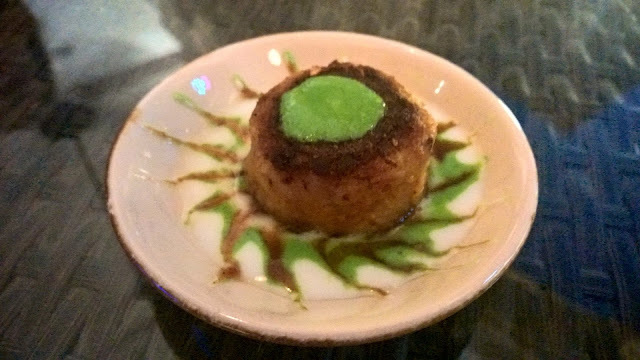 We start off with an amuse bouche of Green pea stuffed potato. Mint and sweet yogurt add some extra flavour. I really like the idea of an amuse bouche - it is not only the domain of fine dining. My guest and I opt for a series of starters so as to get a better sense of what Executive chef Mandal is doing with his dishes. We start off with the Hasrat-e-Hussen, tandoori baked cottage cheese. The presentation sets the tone for the evening - served on a flat bread serving board - casual and contemporary! Unfortunately, I find it too dry as it is somewhat overdone. But kudos for presentation. This is where a chutney or sauce might actually do the trick. 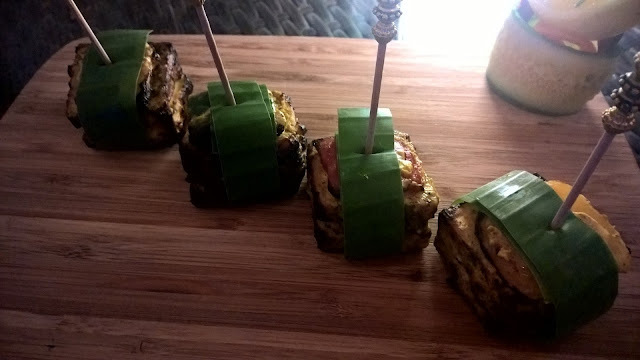 Not long after, we have the Salmon tikka. 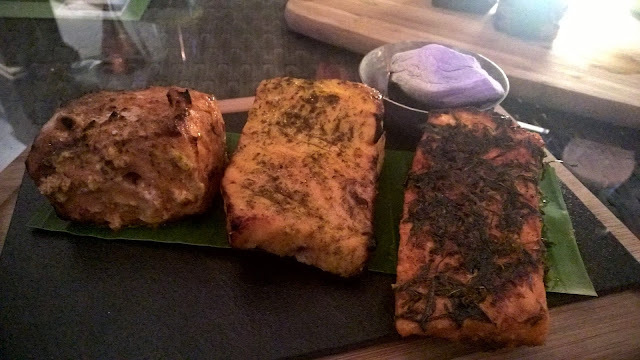 Three pieces of salmon are cooked three ways. Firstly, pan seared with curry leaves, secondly char-grilled with chilli yogurt marinade and finally one with saffron honey marinade. This trio of salmon is very challenging from a chef's point of view - is he able to be consistent with the way they are cooked? The chilli yogurt salmon is quite subtle in its spiciness, while the salmon is cooked beautifully, with a lot of moisture. As for the saffron honey salmon, the flavours are balanced, but it is still the saffron that makes it special. Again, tender and juicy, if one can describe salmon in that way. 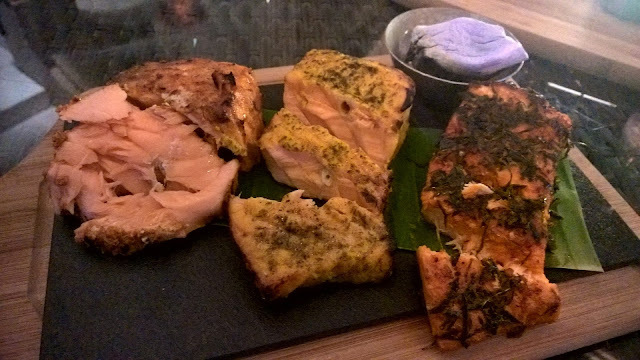 Finally, the salmon seared with curry leaves - the best of three very good interpretations - very intensely flavoured. Overall, a credit to Chef, and at 79AED, a real steal. Another starter, not pictured, that my guest and I have is the Sunheri Jheenga, or Tiger prawns. Marinated with saffron and yogurt, I am not quite sure what I like more: the way the prawn is cooked or the generous saffron that is used. Next up, we have the Punjabi chicken tikka - the knife just cuts effortlessly through the chicken, while yogurt chutney combines with the spices to create a flavoursome, fun-to- eat dish. 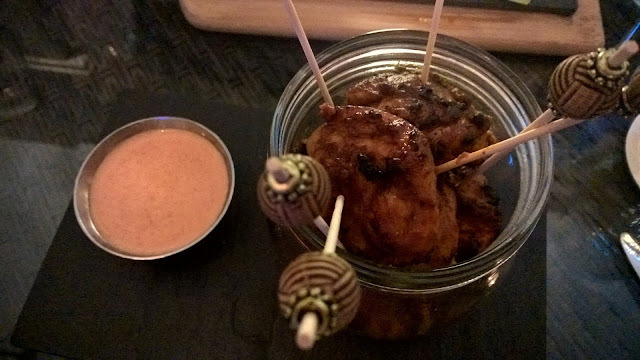 For that full fun experience, eat it from the tiny skewers! While we had a Sparkling rosé with our meal, I could see beer going supremely well with the chicken. In terms of service, we are delighted to be waited on by Dolma, a waitress who understands quite well the concept of engaging service. I often bemoan the narrow perception that a lot of waiting staff have of 'engaging a guest' - it is also about eyes, and when you have a waitress who communicates effectively with her eyes, it bodes well. Having said that, this was not consistent among all staff, so it could be a point to look at. I am surprised that there are not more people who opt for a selection of starters. Of course, the cost is a prohibiting factor, but what I note at Avasa is the price of all the dishes which under-cuts all the other high-end Indian restaurants, making it possible to have a number of starters and then to go onto a main course. The fun element continues, though, with the Aloo papdi tikki, a corn crusted potato patty, served with two sauces - tamarind and sweet mint. There is only one way to eat this dish, more a chaat than a dish, and that is with my hands. Crunchy. Crispy. Finger licking worthy. 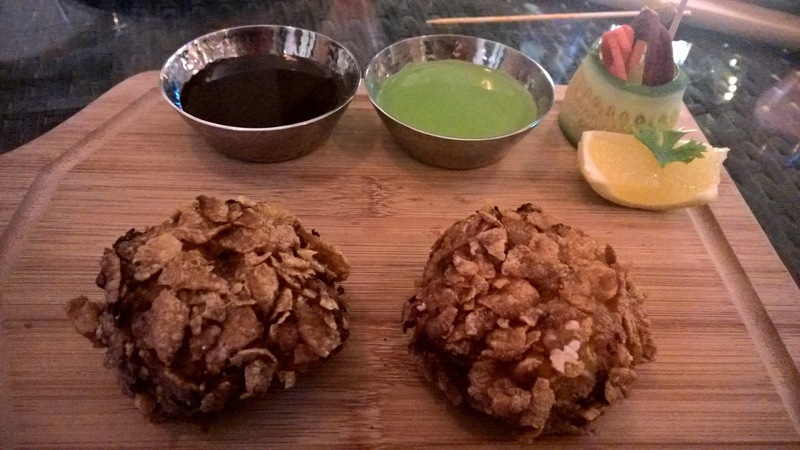 Two main dishes intrigue, based on their description on the menu. The question is, will they deliver on taste and texture? First, the Duck mussalam (not pictured) evokes my curiosity because of the confit of duck, a cooking style of duck I have not seen on an Indian menu in the city. But I am also apprehensive because the style of cooking does result in the duck being dry. That concern, however, proves unfounded because Chef has cooked it rather well. Like me, I am sure you will also enjoy the accompanying tomato gravy and minty potatoes. Recommended because it is so different. Secondly, the Singhara palak chilgoza, to express it as succinctly as I can, is my dish of the day. 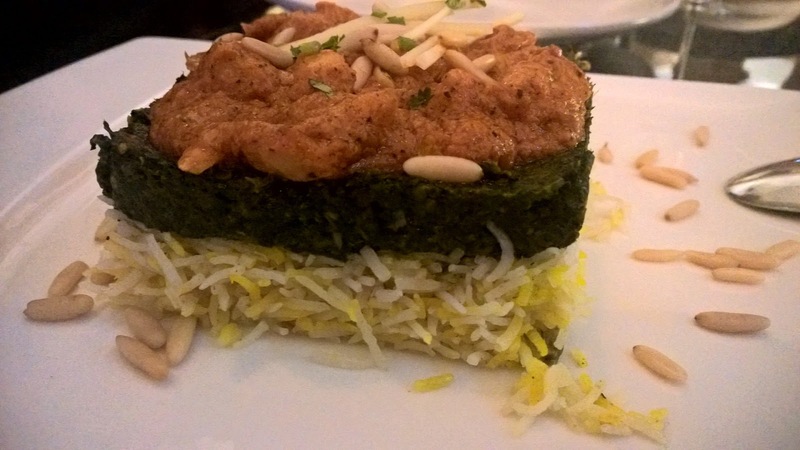 A bed of saffron rice is topped with garlic spinach and tomato cream. Pine nuts are sprinkled on the dish to add some texture. However, the real clincher is the water chestnuts - an unusual but wonderful ingredient here in Abu Dhabi. Overall, a homely dish that brings together simple ingredients that go so well together. It might tempt any meat eater to give up meat for a night. 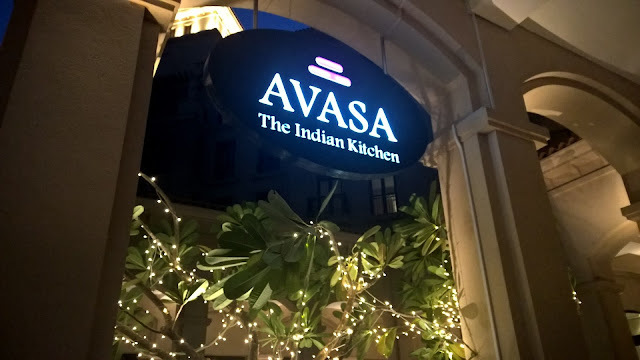 Avasa Indian Kitchen, with its location, menu and pricing really give it a niche, offering traditional Indian dishes with a twist - a twist that is manifested in the surprising flavours, presentation of dishes and relaxed but casual feel to your dining experience. Its pricing is particularly worthy of mentioning, making it the best priced licenced Indian restaurant in Abu Dhabi. And finally, as the name Kitchen suggests, it is small and intimate. This all sounds like a geat way to spend the evening! Disclaimer: I visit restaurants and hotels in an attempt to look at the entire product to take service levels to where they should be. 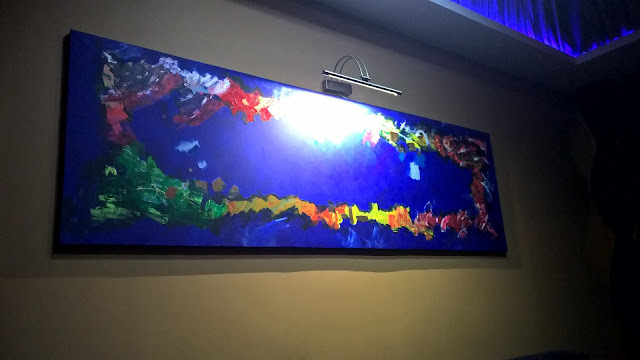 While I am not paid for my reviews, I did visit Avasa Indian restaurant by invitation.